In response to CNBC’s “HVMN (Nootrobox) study: smart pill less effective than caffeine"
HVMN conducted research on a potential variant of SPRINT called CAF+, which is NOT related to the current SPRINT product that is on the market. HVMN is constantly experimenting with new components and products and doing research to determine what is effective for our consumers. We expect to publish the research in any case [edit: the paper was published on December 18, 2017], following the normal timeline for peer-reviewed research in an academic journal, but an early manuscript was unfortunately leaked. Based on the research results, we will not be incorporating the variant studied in future versions of SPRINT. CNBC recently obtained a pre-review manuscript of a clinical trial we commissioned on a non-commercial, research variant of SPRINT called CAF+. We write this response to correct inaccurate assertions made in the article. HVMN is constantly experimenting with new components and products and doing research to determine what is effective for our consumers. We follow the normal timeline for publishing peer-reviewed research in an academic journal, but an early version of the manuscript was unfortunately leaked before being completed. The research study in question was conducted by Maastricht was designed with two goals: 1. confirm the known positive effects of caffeine on cognitive performance, and 2. explore the synergistic effects of caffeine in combination with other compounds (the SPRINT variant we dubbed CAF+). Let's look at the raw data. Out of 84 total measures, 3 measures showed caffeine-alone performed better than CAF+, 2 measures showed caffeine-alone performed better than placebo, 1 measure where CAF+ performed better than caffeine-alone, and caffeine-alone was the only intervention that increased blood pressure (associated with headaches). Caffeine (which served as the “positive control”) improved performance vs. placebo in 2 of 22 total cognitive tasks. One might expect to see a stronger signal between the “positive control” of caffeine vs. placebo as seen in existing literature1 . Outside of the cognitive testing, the physiological measures collected in the study did show results that are consistent with the literature. Subjective alertness of subjects with CAF+ was improved over caffeine alone which replicated previous studies that added L-theanine to caffeine2. Furthermore, CAF+ did not increase blood pressure. One of the biggest downsides of caffeine is high blood pressure and the constriction of blood flow3. CAF+ eliminated this negative effect. 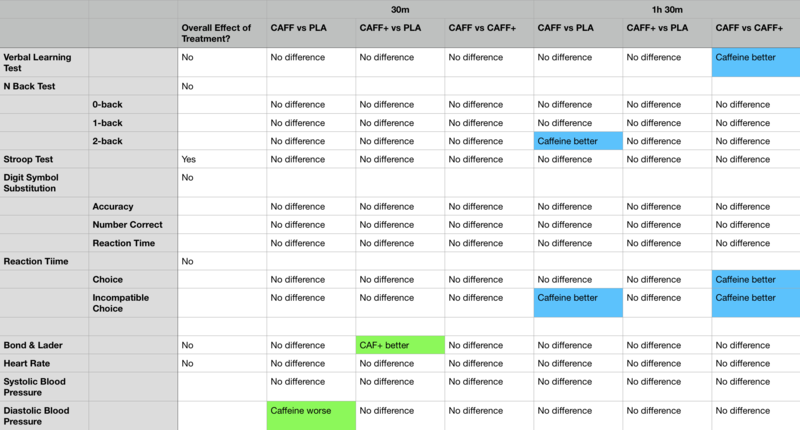 Regardless, a robust product CAF+ or any variant should have much stronger signal than both current gold-standard or placebo to be seen as pushing performance. This is a learning opportunity for us, as we improve our methodologies for researching effective updates to SPRINT and the rest of the HVMN product lineup. When the paper is available, we invite you to take a look and welcome any comments [edit: now available here]. -- "Sources said the company hoped to delay publication of the study and asked researchers to change the name of the product to distance it from the analysis." This is categorically false. We did not delay or obstruct the submission and publication of the study or data. Prof. Arjan Blokland of Maastricht, who is senior author on the study and a key source of the CNBC article says "You can quote me on that. There was no obstruction or delay of the publication of the study." Contributors on this project and our email records and email correspondence will prove assertions made in the article to be false. Unfortunately, this study was leaked prior to peer review publication. We will be addressing this through appropriate channels. When the paper is available, we will update clinicaltrials.gov and link to the publication [edit: now available here]. -- “After the disappointing results, Woo emailed the researchers requesting that the product tested not be labeled SPRINT." We don’t agree with the characterization that this is backing away. To be clear: CAF+ is a non-commercial, research variant. CAF+ contains 25% less L-Tyrosine and 16x amount of B12. The other ratios of CAF+ are the same as SPRINT. CAF+ is based on 100mg caffeine per capsule whereas SPRINT is currently 50 mg caffeine per capsule. The decision to name the Maastricht study compound CAF+ was to be scientifically accurate. Firstly, it is typical to describe the compounds used by chemical makeup rather than a brand name in literature. Secondly, SPRINT is a brand name for a product whose component ingredients are subject to update/change over time. For context, our current SPRINT offering on the market is the 3rd iteration of the product, and we are constantly exploring a number of variants, as we continue to update the product. To lock in a brand name on a static research paper is confusing as we introduce our 4th version and so on. The key takeaway we hope to leave with the reader is that science isn’t just an article headline. It’s subtle; it’s hard; it’s messy; it’s nuanced. We’re proud of our process of transparently conducting RCTs to push understanding of human performance forward. We stand behind it. Improving the human experience is a noble goal. This is audacious mission we know, but we will inexorably continue to work hard to contribute to this field. * Per academic protocol, we would typically not share raw data or comment on research pending peer review. This is a special case. 3. Dodd, F. (2015). A double-blind, placebo-controlled study evaluating the effects of caffeine and L-theanine both alone and in combination on cerebral blood flow, cognition and mood. Psychopharmacology Volume 14, Issue 232, March 2015, Pages 2563–2576.